Trump International Hotel & Tower New York, a hotel in Manhattan overlooking Central Park, is pleased to announce the renovation of its guest rooms, suites and common spaces. A collaboration among Trump Hotels, Eric Trump, Trump Construction and New York-based design firm, Total Resource Associates Inc., the renovation creates a first class, ultra-sophisticated ambiance reflecting the hotel’s vibrant New York City location. 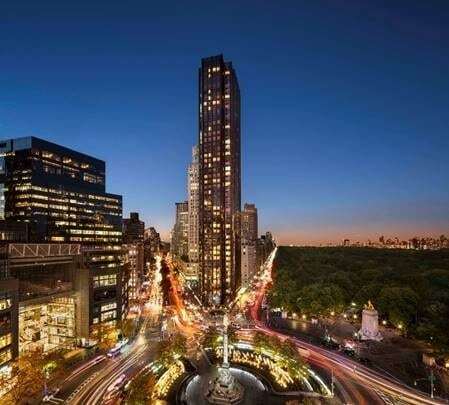 Total Resource Associates Inc. found inspiration in the hotel’s stunning Central Park views and its proximity to Manhattan’s famed Columbus Circle. The renovation includes a total transformation of the hallways, including carpeting, a new color palette and lighting; guest rooms and suites, including sparkling LED crystal chandeliers and custom wall sconces, deep wood crown molding and base, carpeting, fixtures and fittings, upholstery and bedding; and guest room and suite bathrooms, featuring polished chrome Kohler fixtures, glass-enclosed shower partitions, new comfort height toilets and custom wood vanities with marble tops. The new finishes and materials have been designed to infuse every aspect of the guest experience with the refined aesthetic that envelops guests when they arrive at the luxury hotel in Manhattan. The award-winning property consistently provides guests with thoughtful, attentive and highly personalized service in an authentic, warm and non-intrusive manner. Every Trump Hotels guest has access to the signature Trump Attaché service. More than a concierge or butler, Trump Attaché delivers personalized attention without intrusion, so guests experience an unprecedented level of VIP treatment upon request or sometimes before. Among five-star hotels in New York City, Trump International Hotel & Tower New York is uniquely distinguished as home to Jean-Georges, the Five-Star/Five-Diamond restaurant that opened with the property and embodies New York fine dining. Sustainable growth is one of the sector’s most pressing challenges and a strategic priority for WTTC.